Following marathons held in the Médoc and Sauternes, St-Emilion is the latest Bordeaux appellation to host its own run. 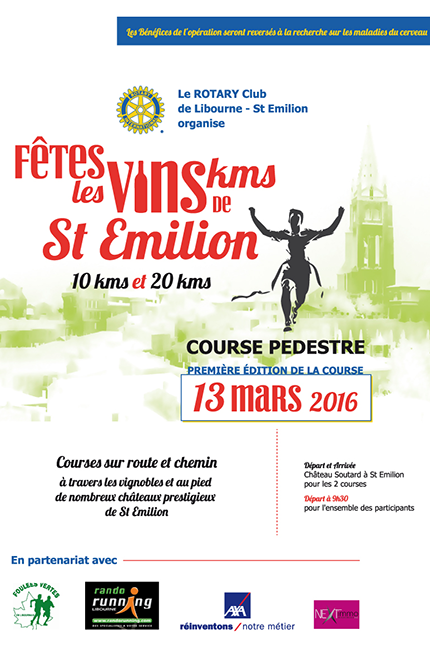 Due to take place on March 13 2016 – a few weeks before the Bordeaux En Primeur tastings – the Fêtes les Vins Kms de St-Emilion will start and finish at Château Soutard, just five minutes from the the Romanesque church of St-Emilion. Runners will be able to choose between two routes of 11km and 22km that will follow the same path until Château Angélus, when the shorter run will head back to Soutard via Château Canon, and the longer will continue round to Château La Dominique and the Corbin plateau. Etienne Barre, courtier at Barre & Touton, is helping to organise the marathon through the Rotary Club of St-Emilion and Libourne, and all money raised will go to brain cancer charities. ‘Although this is not a full marathon, the hills of St-Emilion make it an excellent challenge,’ Barre told decanter.com. ‘The final route is not quite decided but we already know that some estates, including Grand Corbin Despagne, La Dominique and Montlabert, will be putting on wine tastings or other entertainments for the competitors’. The Bordeaux region also holds the Médoc marathon every September and since April 2014 has an annual night-time marathon through the UNESCO centre of Bordeaux city. Sauternes launched its own version in 2011, but it received only 400 runners in June 2015, and has been cancelled for 2016.